24 years of guiding experience in Vermont. I have never fished with a guide before my trip with Willy on 9 May 2016. 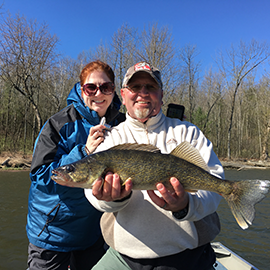 My wife and I were guided on a 1/2 day trip in search of walleye. We were immediately put at ease when we met Willy on the morning of our trip. He made us feel relaxed, was extremely personable and willingly shared some of his extensive fishing knowledge. After some brief tips from Willy my wife hooked and boated her first ever walleye, and a dandy it was! My only regret was that we didn’t book a trip with Willy sooner. We look forwarded to visiting the Stowe area again and schedule many more trips with Willy and Catamount Adventures. Thanks for the great fishing trip Willy!